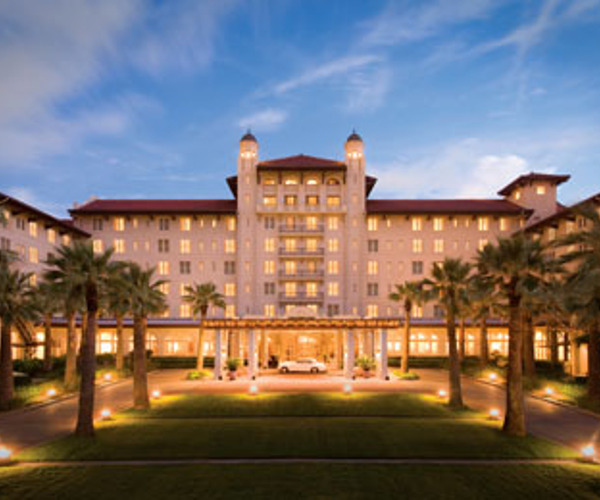 Located along the shores of the Gulf of Mexico, the Hotel Galvez and Spa holds the title of being the only historic beachfront hotel in Galveston, Texas. Known as the "Queen of the Gulf," the AAA Four Diamond-awarded property has hosted the likes of dignitaries and celebrity clientele since its inception in 1911 and is listed as a historic landmark by the National Register of Historic Places. A circular-drive entrance lined with manicured foliage leads guests to the hotel, while interiors, with their mahogany ceilings, detailed stenciling, dramatic columns, and crown moldings, reflect the hotel's old-world charm while merging modern amenities to accommodate the contemporary traveler. Each of the 227 rooms and suites offers scenic water or island views, and business and event facilities include the grand Music Hall and Parlors. A full-service salon, fitness center, and outdoor meditation garden are just a few of the luxuries found at the Mediterranean-inspired spa, and there is an outdoor pool with a swim-up bar. The Spa at the Hotel Galvez celebrates its oceanfront setting with a Mediterranean-style vibe and extensive menu of services showcasing the coast's indigenous ingredients. The 10,000-square-foot spa comprises eight treatment rooms, including hydrotherapy and Vichy shower areas and a couple's room, along with a salon, fitness center, boutique, and outdoor meditation garden with a reflection pond. Men's and women's locker rooms come complete with steam rooms, and a private lounge is available for small groups and parties. 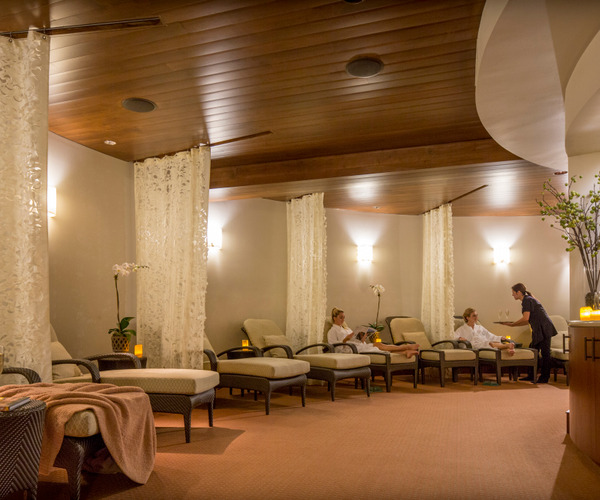 Before or after treatments, guests can take advantage of the relaxation room, sipping fruit-infused drinks from the beverage bar and enjoying individually adjusted lighting and music from their lounge chairs. Sea-inspired offerings include the Sea of Calm and Island of Youth Facials, the Marine Mud Detoxifying Body Mask, and the Warm Seaweed Mud Wrap. Guests can also unwind with massage modalities including Swedish, deep-tissue, four hands, and hot stone; nail, hair, and waxing treatments are also available. Steps from the historic hotel, guests can splash in the Gulf or sunbathe along the stretches of sand (umbrellas and beach chairs are available for guest use). On-site amenities include a fitness center and outdoor swimming pool with a swim-up bar and hot tub, open year-round, and complimentary bicycles for adult guests. There are more than 13,000 square feet of meeting and event space, with venues that include two ballrooms, a poolside veranda, music hall, boardrooms, and parlors. Galveston offers a wealth of activity that combines the coastal city's rich history with modernism. There are six historic districts to explore, including the Strand National Historic Landmark District, lined with antique stores, restaurants, museums, and galleries housed in Victorian era-style buildings. Cultural buffs can take in a ballet or theater performance at the Grand 1894 Opera House, and sports enthusiasts can enjoy nearby golf or deep-sea fishing. Additional tourist destinations include Moody Gardens botanical park and the Port of Galveston, and Seawall Boulevard, home to several dining and nightlife establishments, is located down the street from the hotel. Hotel Galvez's classically styled guest accommodations, scheduled to be complete renovation in 2011, combine comfortable luxuries like pillow-top mattresses and individual climate control with chic details such as crown molding, scalloped sinks with porcelain faucets, and rich draperies. The hotel features new spa-inspired rooms on the sixth floor, which offer rain showers, Janus et Cie furnishings, and Italian-made Anichini bedding. Standard room amenities include cable TV, in-room safes, minibars, and complimentary high-speed Internet. Suites also feature sitting areas and marble baths. The hotel's signature Bernardo's restaurant, located off the lobby, overlooks picturesque ocean vistas and offers a menu of Spanish fare and seafood specialties sourced from the Gulf waters. Open for breakfast, lunch, and dinner, Bernardo's is a trendy spot for champagne brunch on Sundays. Guests can also enjoy in-room dining.